Costa Rica is actually known as the Republic of Costa Rica, and it is a small country in Central America. Nevertheless, you will be enchanted. It has a tropical climate all year round, and the scenery is exceptional. The wildlife is phenomenal, and if you are a bird enthusiast, you will think that Costa Rica is heaven. Plus, let’s not forget about the perfect beaches and the clear blue waters that are ideal for diving and snorkeling. You can also choose to go rafting and surf, and if your physical condition allows it, you can bike through the mountains. The trails are simply amazing. Before you depart for Costa Rica, you need to see whether or not you need a visa. Lucky for you, the visa policy of Costa Rica is pretty lenient, but it does contain some restrictions for some nationalities. Some nationalities from Africa, the Middle East, and Asia need to have their visa approved by the Commission of Restricted Visas. However, many countries in the world are visa exempt, and their nationals can stay in Costa Rica for up to 90 days. To see in which category you are in, you can take a look at Costa Rica’s visa policy. Or, and this is an easier way, you can use iVisa’s Visa Checker. It is toll located in the top right corner of this page. All you must do is choose your country of origin from the drag-down menu and pick Costa Rica as your destination. If you do not need a visa, you can plan your trip. If you do, you will be given a list of the embassies you can use to apply. Simple, right? iVisa does not have Costa Rica as a supported country at the moment. The visa policy does not mention the electronic visa system. However, we still want to help you in any way that we can. Information is all we can provide at the moment, which is why our support service is at your disposal 24/7 and is free of charge. 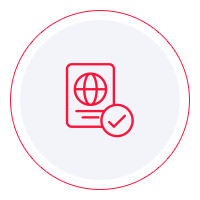 If you need to apply for a Costa Rica visa at the embassy, you must learn about the requirements. While you can do that on the internet, we recommend that you call the diplomatic mission itself. It is the most reliable source of information. Websites are not always brought up to date, and that can lead to mistakes. Just give the embassy a call, and you will find out what you need to know. However, what we can tell you is that you need a passport that is valid and remains as such for at least another 6 months from the date of arrival in Costa Rica. For further information, contact the nearest embassy of Costa Rica. While we cannot help more at this moment, we do hope that the information above is of some assistance. As soon as electronic visas for Costa Rica become available, we will be able to provide more support, but in the meantime, we hope that your visa application process at the embassy goes smoothly and without incidents.